Hirose wins King of New Stars: Fittingly enough, the younger player prevailed in the 43rd King of the New Stars (Shinjin- O) title match, with the 17-year-old Hirose Yuichi 2P (right) beating the 23-year-old Onishi Kenya 3P (left). The first game was played on September 21; taking white, Hirose won by resignation after 144 moves. The second game was played on October 1. Hirose (B) won by 4.5 points. The venue for both games was the Nihon Ki-in in Tokyo. Prize money is 2,000,000 yen (about $18,000). This tournament has traditionally been regarded as a stepping stone for future champions. Recent winners include Shibano Toramaru (2017), Kyo Kagen (2015), and Ichiriki Ryo (2014). You won’t find Iyama Yuta’s name in the list, because at the age of 16 he was promoted to 7-dan for winning the Agon Kiriyama Cup. The conditions for participation are that you be 6-dan or under and 25 or under, both as of August 1. 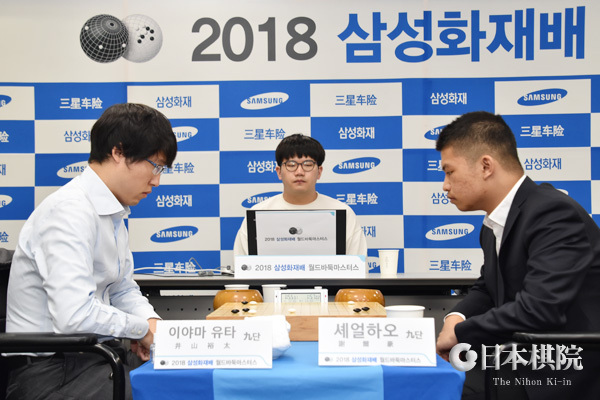 Iyama eliminated from Samsung: The best eight in the 2018 Samsung Cup was as far as Iyama Yuta could go. 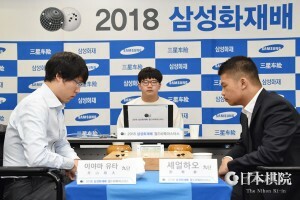 He was matched against the player who beat him in this year’s LG Cup final and he failed to take revenge. Full results in the quarterfinals follow (games played on October 2). Xie Erhao 9P (China, right) (W) beat Iyama Yuta 9P (Japan, left) by resig. ; Ke Jie 9P (China) (B) beat Shin Jinseo 9P (Korea) by resig. ; Tang Weixing 9P (China) (W) beat Shin Minjun 9P (Korea) by resig. ; Ahn Kukhyun 8P (Korea) (B) beat Lian Xiao 9P (China) by resig. Pairings in the semifinals are Ke v. Xie and Tang v. An. The semis are best-of-three and are scheduled for Nov. 5, 6, and 7. Correction. I got the name of Iyama’s opponent in the second round wrong. It should be Li Xuanhao, not Li Jianhao. New tournament for non-winners: The Masters Cup is a tournament for senior players who have won a top-seven title. Now a new tournament has appeared that is the reverse: it is for players at the Nihon Ki-in aged from 31 to 60 who have not won a top-seven title or the Ryusei or the Agon Kiriyama Cup. The tournament is the 1st SGW Cup: Golden Mean Tournament. The golden mean is a Confucian term referring to acting without bias; I don’t know what the significance of the term is here, and an enquiry with the Nihon Ki-in did not enlighten me. The main sponsor is a real-estate company called St. Grande W. First prize will be 2,000,000 yen (about $18,000) and second prize is 500,000 yen. Preliminaries will be held on the Nihon Ki-in’s Net site in October and November; time allowance will be 20 seconds per move plus 1 minute x 5. The top 16 will play in the main tournament, which will be a four-round Swiss System held at the Nihon Ki-in on December 8 and 9. Here the time limit will be 30 seconds per move plus 1 minute x 5. The winner will “graduate” from the tournament. 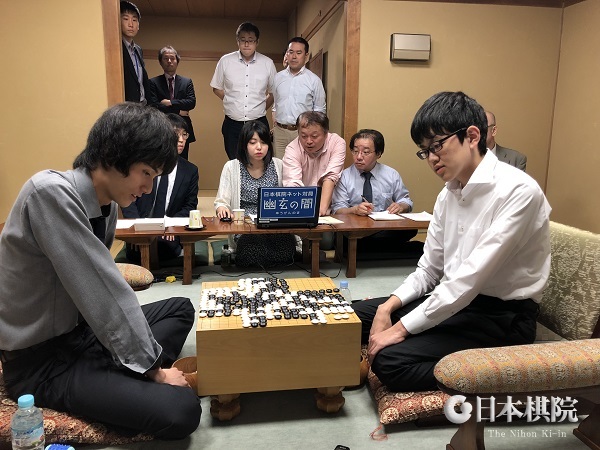 Ichiriki wins Agon Kiriyama Cup: The final of the 25th Agon Kiriyama Cup featured a clash between two of the top players in the post-Iyama generation: Ichiriki Ryo 8P (left), the top player among those in their early 20s, and Shibano Toramaru 7P, the top teenager. The game was played at the Mt. Shaka Bodai Temple, the Kyoto headquarters of the Agon Buddhist sect. Taking black, Ichiriki won by resig. after 213 moves. First prize is a handsome 10,000,000 yen (about $90,000), which is more than for two top-seven titles (the Gosei, with 8,000,000, and the Judan, with 7,000,000). Financially, Ichiriki is undoubtedly doing better than his classmates at Waseda University, where he is a “full-time” student, as recently he also won the Ryusei title (worth 6,000,000 – see my October 1 report). Onishi wins again in Kisei knock-out: The second game in the irregular knock-out to decide the Kisei challenger was held on October 8. 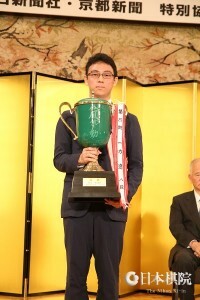 Taking white, Onishi Ryuhei 3P, winner of the C League, beat Murakawa Daisuke 8P, winner of the A League, by resig. Next, he will face Kono Rin 9P, who came second in the S League. The winner of that game will meet Yamashita Keigo 9P, winner of the S League.